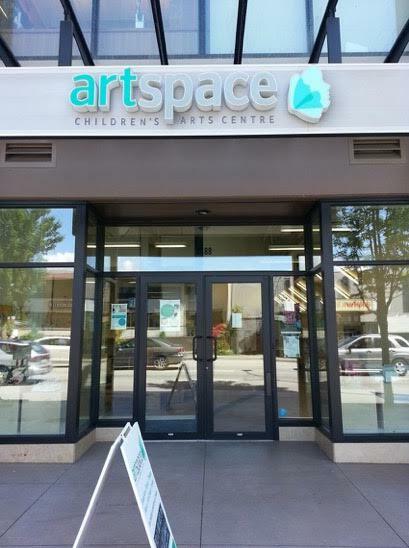 Where Does Cheryl Teach? Who Does She Share Teachings With? 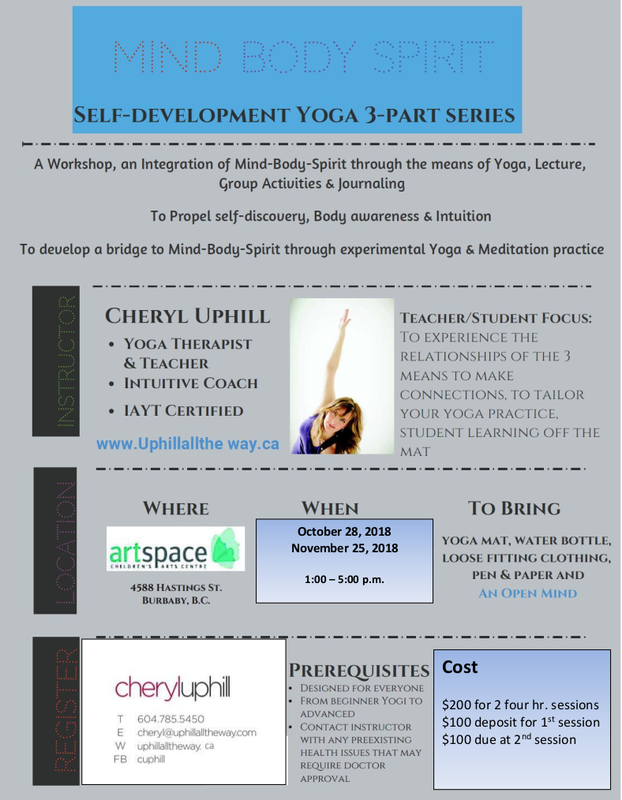 A 3 part series (click images to enlarge) PLEASE NOTE REVISED workshop dates and times. Awareness of your body alignment & your body’s boundaries to help heal injuries, & relief in pain. Develop Strength, Stability, Mobility, Flexibility. What is Yoga and how does it relate to Yoga Therapy? A yoga therapist helps guide the client through the journey of their life and the many struggles we must all face being human. The most therapeutic value lies within the very dynamic of the relationship of the client and yoga therapist. Building rapport and understanding between them is key with clear and regular communication. Yoga therapy is difficult to define, in part because of the breadth and depth of the tradition itself, and because, like Yoga, the discipline can be approached in so many different ways. Nonetheless, for Yoga therapy to be better understood and accepted, it is necessary to have a reasonable and pragmatic definition understandable to those without experience with Yoga, yet still acceptable to those steeped in the practice and philosophy. Energetic subtle body awareness and the psychology behind it (Metaphysical approach). Yoga Psychology is the study of the mind and the yogic methods for transforming our personality and our experience of consciousness. Yoga Nidra- Relaxation, guided imagery and teaching your body to come from a calm centered place. YT offers Asana (poses easily held) or body movements to address the body, Pranayama (breath work) to address the mind and Meditation (Dyhana) to address the spirit. YT does not claim to diagnose a client’s physical or psychological condition, or prescribe a treatment that goes against the client’s health professional’s advice. In fact many Yoga Therapist’s work directly with Physiotherapy, Physical Therapist’s, RMT’s, OT’s even Doctor’s on occasion, as part of your wellness team to aid in pre:surgery, recovery and healing. YT can help in many areas which include: Anxiety, Depression, Cancer, auto immune diseases, Chronic Illness and pain, Grief & Loss Relief, treatment of addiction and PSTD. Hands on approach… Therapeutic touch and reconnecting with your inner self. Touch is a very important part of yoga therapy as it a tool for your proprioceptive learning. 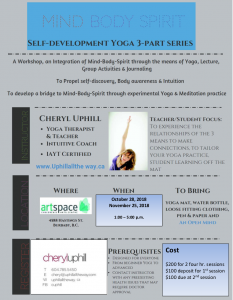 Teaching you to feel more in your body, breath, and spirit! Restorative poses to aid in relaxation, calming of the nervous systems and stress management tools to help aid in working in the concrete jungle of your life. Physiological, emotional, spiritual, healing responses in the tissues of the physical body, mind and heart. Can help improve ones health, self-awareness, reduction in tension throughout the whole body into the connective tissues and muscles, strengthening the mind – Body connection and creating balance, freedom of limitations in the body and improve your attitude towards self-caring and worth. Can be known to prevent suffering in; physical & structural limitations, emotional & spiritual pain. 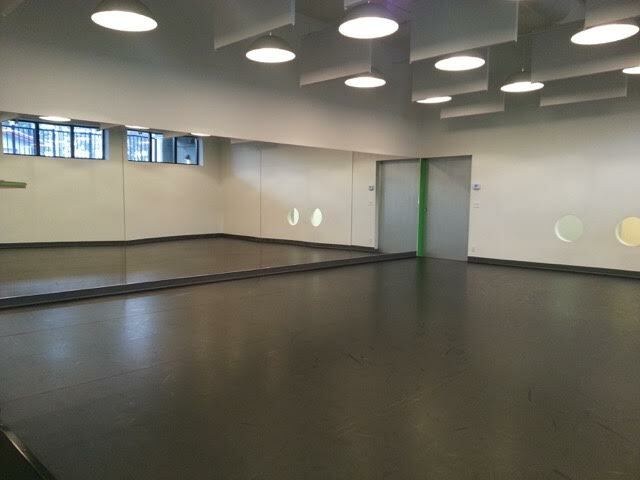 YT can; build strength, balance in Mind, Body and Spirit, flexibility in the muscles, connective tissues, and joints, improves respiratory & cardiovascular function and of the endocrine systems, promote recovery in injuries, surgeries, and aids in treatment of addiction. Reduces; Anxiety/Depression, stress, chronic pain, cortisol levels, and blood pressure. It enhances; a complete overall well-being, brain and limbic function, higher quality of life, self-care, self-confidence, optimism, increased serotonin levels and improves in sleep disturbances. Shifts energy on the physiological level from sympathetic nervous system (flight-fight-freeze response) to parasympathetic nervous system that induces a relaxation response. Provides equanimity to cope with the daily stresses of life as we move through the stages of life and targets the root cause of the affliction. It enhances the overall quality of life and reduces suffering. My approach to Yoga Therapy? I have had chronic pain, many injuries, challenges and surgeries after being an athlete most of my life in martial arts. 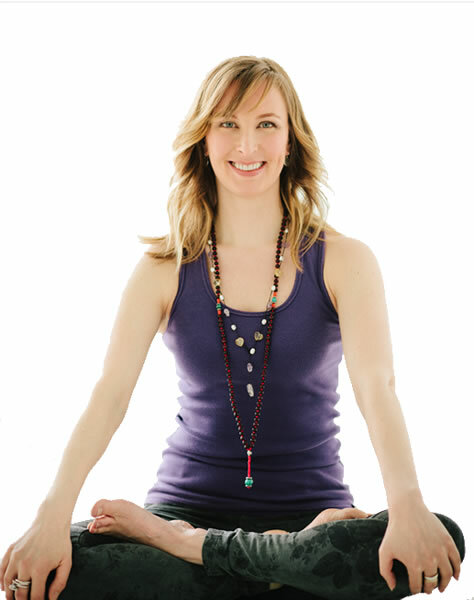 I specialize in the areas of providing tools for those in chronic pain, grief/loss management, physical, emotional and spiritual injuries, And prescribe many therapeutic remedies & practices through restorative poses, meditation, Mind, Body, Breath, Spirit and Energetic awareness, structural alignment, Ayurveda, Stress Management and hands on techniques. My definition of yoga therapy is where science meets spirituality. A mind-Body medicine that empowers the client to self-actualization. Learning to guide oneself through empowerment to become your own healer, higher self, teacher, best friend and soul mate. YT offers a wide range of tools to everyone no matter what the issue may be. It’s biggest benefit may be that it empowers people in the healing process. They can step aside from being medicalized, being the patient and become a student of knowledge into the self. I have read many things that Yoga therapy is the wave of the future in integrative, holistic approaches to overall wellness! It is a perfect blend of mind body and spirit and is leading edge with new discoveries all the time as it is constantly shifting, changing like our physical bodies as they age. What are the main principles of this form of Yoga therapy? What happens after you have decided to try yoga therapy? The necessary paperwork will be sent to you via email or it can be downloaded off this website. It includes: History/ Lifestyle form and determine your dosha assessment. 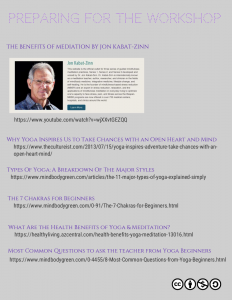 *If you require the Yoga Therapist to have an open dialogue with your doctor or other related therapist’s, with your written permission, it can be done for a small fee. What happens when we meet the first time? After your paperwork has been reviewed , there will be one more intake form to complete in person upon the first visit. Your assessment recommendations will be built and implemented within the second session. Which will include a detailed home practice of poses, relaxation, meditation and general dietary & nutrition recommendations. Depending on the discoveries made in our first meeting I may be able to facilitate some breathing, movement and poses to take away with you right away. What are some contemporary definitions of Yoga therapy? 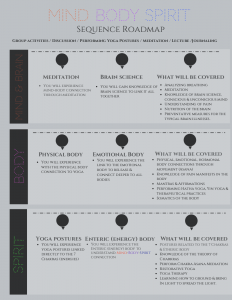 Yoga therapy is a self-empowering process, where the care-seeker, with the help of the Yoga therapist, implements a personalized and evolving Yoga practice, that not only addresses the illness in a multi-dimensional manner, but also aims to alleviate his/her suffering in a progressive, non-invasive and complementary manner. Depending upon the nature of the illness, Yoga therapy can not only be preventative or curative, but also serve a means to manage the illness, or facilitate healing in the person at all levels. Yoga therapy may be defined as the application of yogic principles to a particular person with the objective of achieving a particular spiritual, psychological, or physiological goal. The means employed are comprised of intelligently conceived steps that include but are not limited to the components of Ashtanga Yoga, which includes the educational teachings of yama, niyama, asana, pranayama, pratyahara, dharana, dhyana, and samadhi. Also included are the application of meditation, textual study, spiritual or psychological counseling, chanting, imagery, prayer, and ritual to meet the needs of the individual. Yoga therapy respects individual differences in age, culture, religion, philosophy, occupation, and mental and physical health. The knowledgeable and competent yogin or yogini applies Yoga Therapy according to the period, the place, and the practitioner’s age, strength, and activities. 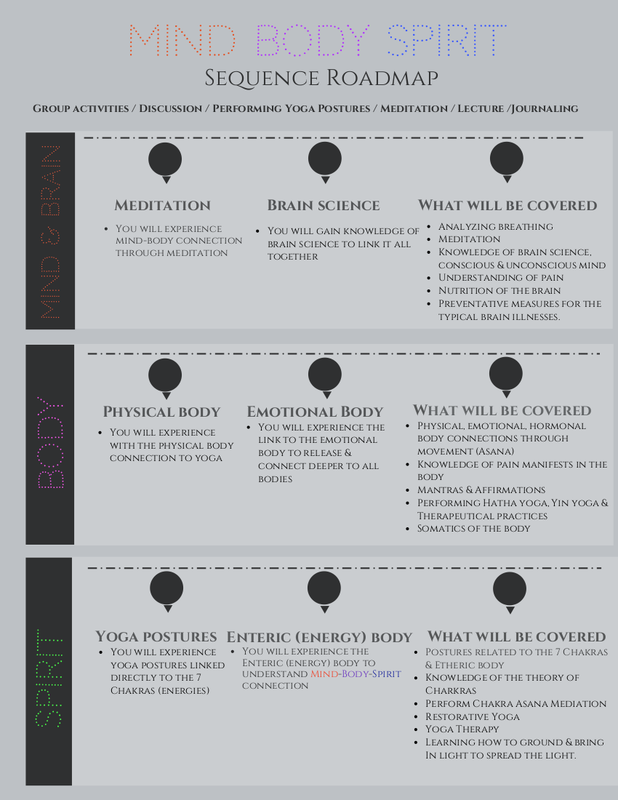 Yoga therapy is of modern coinage and represents a first effort to integrate traditional yogic concepts and techniques with Western medical and psychological knowledge. Whereas traditional Yoga is primarily concerned with personal transcendence on the part of a “normal” or healthy individual, Yoga therapy aims at the holistic treatment of various kinds of psychological or somatic dysfunctions ranging from back problems to emotional distress. Both approaches, however, share an understanding of the human being as an integrated body-mind system, which can function optimally only when there is a state of dynamic balance. Yoga therapy is a holistic healing art. Rather than prescribe treatments, it invites presence and awareness. Using age-old yogic approaches to deeper presence and awareness, we are able to know ourselves more fully. Out of that knowing, we are more easily moved to embrace the opportunity for change, growth, and enhanced well-being in body, feelings, thought, and spirit. Yoga therapy is the application of Yoga to individuals to empower them to progress toward greater health and freedom from disease. Traditionally, yoga is a path of self-transformation, self-realization, and transcendence. In my book Yoga for Wellness I used the image of a launch pad to explain that kind of yoga. Therapeutically, yoga is more like a life raft. When you’re drowning, yoga therapy gets you back up and integrated into yourself. The primary perspective of the yoga therapist is different from that of a Western physician, or even an ayurvedic physician. An allopathic doctor’s job is to work with disease and cure it. Our approach is to work with the human beings who have the disease—to help them develop a better attitude and get a better perspective on themselves and basically to help them with their mind. That doesn’t mean that we don’t work in a curative direction with certain conditions. But if we’re working with somebody who has cancer, we encourage them to see a doctor; we don’t say, “Why don’t you stop using chemotherapy and try pranayama instead?” If somebody is undergoing chemotherapy, I’ll work with them to improve their digestion, help their sleep, stimulate the immune system, or help them feel better about themselves. So yoga therapy is complementary, not primary for conditions like cancer or AIDS. In the tradition in which I was trained, the foundation for practice for most adults is to create stability at every level—structural stability, physiological stability (which could be equated to immunity, perhaps), and psycho-emotional stability, which is essential given the volatile nature of the external world. The next goal is to help them to awaken slowly and appropriately to a deeper dimension in life—the spiritual dimension—and then help them find a way of linking to that dimension through their heart in a way that’s not counterfeit. You must find an authentic link, something that inspires them. For example, I might ask somebody, “Do you remember what inspired you when you were five or six? Did you go to church? Do you remember the joy?” The point is to reconnect to something they felt in childhood, and to go back to that. Help them return to something deeper inside themselves that gave meaning to their life. Would it be fair to say that stability at all levels is the goal of yoga therapy? That’s a good starting point. Again, we’re talking about therapy. We’re talking about the life raft. What you want to do is get out of danger and reach a stable place. Then if something else awakens we can think about the launch pad to help people elevate to another dimension. I had a powerful epiphany, which I wrote about in my first book. I was watching PBS interview the man who developed the rocket science to launch the Voyager out of the solar system. It was a tricky thing because this satellite was quite small and couldn’t hold enough fuel to propel itself out of the solar system. So this man figured out how to use the “gravity well” of the planets to ricochet the satellite to its next destination. If you shot it too close to the planet, the satellite would crash into the planet. If it was close but not too close, it would go into orbit. But if it was just right it would swing around the planet and pick up momentum from the gravity of the planet and go on. I was watching this and suddenly a light bulb went off in my head. I thought about the normal neurotic who’s in orbit around the planet called me. It’s me, me, me. It’s all about me. (The seriously ill people have crashed into themselves.) Now, we all have challenges, and what I’ve learned in my own life is that when I’m suffering, if I get caught in the loop I just circle around the suffering and I don’t get anywhere. But if I sit with it and relax into it and let myself feel it, I can gain momentum from it and it can propel me forward. That for me is helpful diagnostically. I can watch someone and I see where they’re preoccupied with this neurotic thing, with themselves. Then I figure out how to apply what we call pratipaksha bhavanam, a reframing of a person’s perspective on their own challenges. Pratipaksha is a key idea in yogic theory, not only for working with psychological problems but also for someone who has cancer or diabetes. What we’re trying to do is reframe their way of dealing with emotional challenges. Yoga therapy is complimentary not the primary practice in someone’s healing journey.. Work with the whole human being. Yin, as the name describes is a complimentary practice to a more active (or Yang) practice, or active lifestyle in general. It is the Chinese name equivalent to Hatha Yoga which describes the balance of opposite energies. In the Yin practice we hold postures without any muscular effort and emphasize stillness and complete relaxation; this affects the connective tissue in the body (Fascia, tendon and ligaments) The physical benefits are in re-structuring the joints, and to repair any inbalances caused from conditioning or physical patterning. The mental or psychological benefits are meditative, helping to focus inward on the sensations and thoughts that arise without judgment or fear of moving deeper, as well as releasing stress and tension. In today’s world, we are moving at such fast paces, that we have forgotten the importance of slowing down and being mindful of our breath in each moment. It is through this awareness that we reconnect to the source of that breath, and all that is. Personal and/or spiritual growth. In the case of spiritual growth, we feel it is important to note that the course followed would be initiated by the student’s own interest and complimentary to the student’s personal spiritual practices, beliefs, and preferences. I have known Cheryl since 2000 and seen her grow through many stages into the Intuitive/spiritual being she is today. Through many trials/tribulations and struggles she has landed on top of her game of life. She now shares this with her clients in hopes they may benefit in their journey. Take her yoga class, better yet treat yourself to a session of yoga therapy, you will not be disappointed. 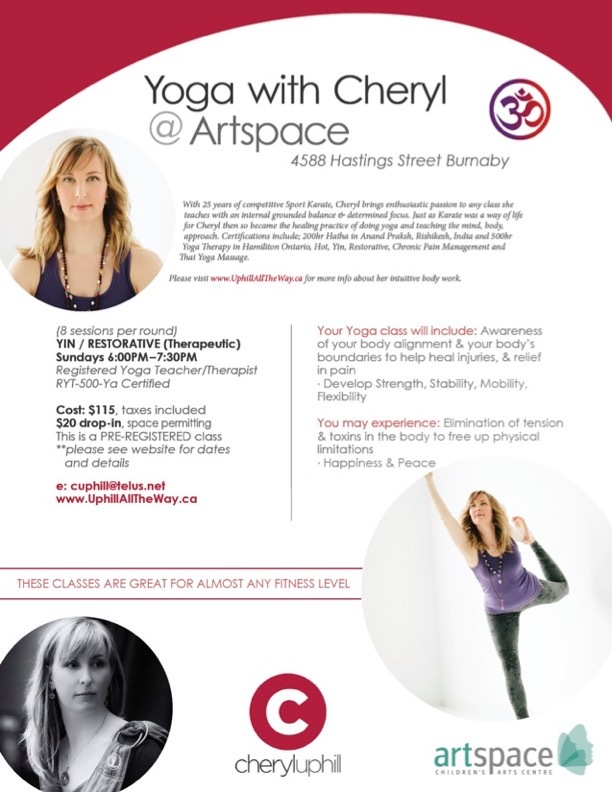 Cheryl is a kind and inspired Yoga therapist and teacher, who relates easily with others and has an innate ability to sense their spiritual and physical needs. She communicates positive energy that fill one with peace, healing and hope. Cheryl is very outgoing, dedicated, and determined. She has a very free spirited personality that leads her to the top of her profession. She is open and willing to learn what it takes to take her where she wants to be. To hire Cheryl you wouldn’t be disappointed. I’ve been practicing yin yoga for 5 years at GoodLife Northgate fitness at least 3 times a week. Just last Monday night after my usual yin yoga restorative class with Cheryl Uphill the most amazing thing happened… I had the most restful qualitative sleep in years. I had slept for over 8 hours and woke up feeling energized and content …which I haven’t experienced since I’ve been a stroke survivor.